When my kids were little - granted two still are this little- they would interrupt me numerous times a day with a book, a sweet look, and the clear request to be read to. More often than not, I would happily oblige. We would curl up on the couch, or even in my desk chair, and work our way through The Very Hungry Caterpillar or The Cat in the Hat or even The Velveteen Rabbit... it was great... most of the time. Sure there were times when they came over with the tenth book of the hour, and I would have to decline because there are still chores that must get done (I doubt they would have wanted to give up their lunch...). And there were times when I would tell them they could sit on the couch and "read" themselves. Of course, they couldn't really read yet, but they knew the story, and the pictures were always great. Part of why you read to your kids is the hope that one day they will want to read by themselves. The hope that you will have children who love to pick up a book to learn something new, or to transport themselves into a world that is different where they can learn empathy or simply grow their imagination. And then that day comes. You have a child who is fairly capable at reading, maybe not reading Tolkien on his own, but certainly capable of early chapter books. You, as the parent, have a new issue at hand... finding books they can read, that challenge them slightly, yet are engaging enough that you don't dash their new found love of independent reading. I know - serious issue! In my search for finding such books, I was given the opportunity to check out the Heroes of the Bible Treasury. This collection has six early reading books. And while it isn't really an early chapter book, having six books in it, allows for the feeling a chapter book. I was more than willing to give a shot. 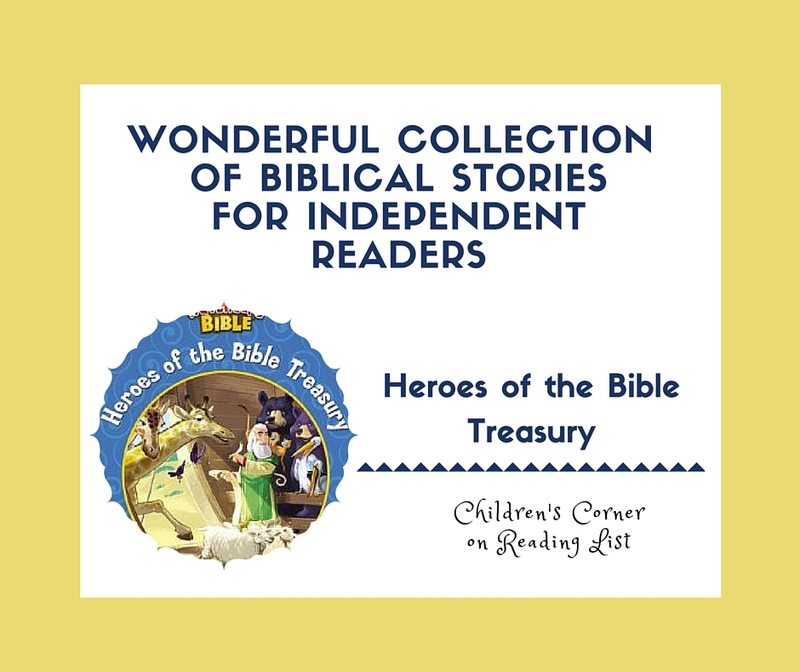 Adventure Bible has put together six individual early reading (level 2, which is called reading with help) books to highlight some of the heroes of the Bible. 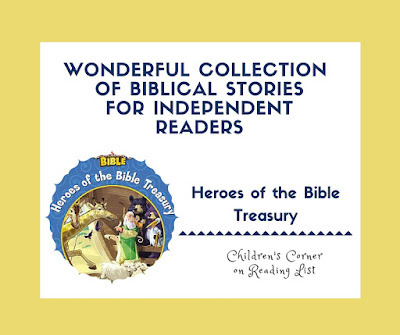 The heroes in this collection include Paul, Esther, Joseph, Noah, Elijah, and Moses. Each story follows the main events of the person from the Bible. 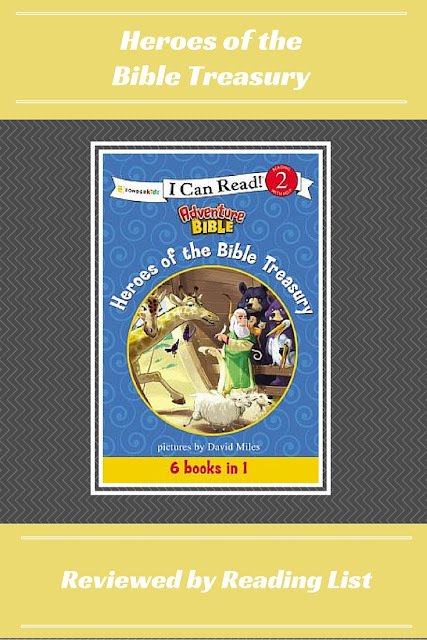 While each story is based in scripture, they are written like a story, to allow for early readers to fully comprehend. Each story ends with a verse from that section of the Bible, a short character description, and a "did you know?" commentary with fun facts. Since these books are all level two, my independent reader is fully able to read each book full on his own. In fact, he has spent a few afternoons reading these books to his brother and sister - which is nice. I am a fan of giving him reading material that is easier for him to read because it builds his confidence while reviewing reading concepts of dialogue, punctuation, and vocabulary that can get glossed over when we work on harder reading material as we focus on new words and sounding words out and such. I was also glad to see that Esther was included in this collection. Too often the heroes of the Bible are all male- granted there are few women to really pick from in comparison to the men. And I was also relieved to see that Jesus wasn't one of the heroes. Too often when we refer to Jesus as a hero in books we equate Him with the heroes of fiction and movies, and let's be honest, that is just not a good comparison. My son really enjoyed the little recaps at the end of each book. The quick little summary of the characters and "did you know?" facts really grabbed his attention. Did you know that the Adventure Bible has a great interactive website and app? It is FREE! How about some more detailed Bible verse coloring pages - great for older kids and adults too! If you are looking to work on some handwriting with your independent reader, here are some great sheets to work through. Follow Marissa Writes's board Reading List Children's Corner Crafts on Pinterest. Are you a fan of the I Can Read! series? Do you allow your kids to pick out books that are "easy" for them to keep their confidence in reading up? Do you prefer to stretch them in their reading abilities?